The aluminium curtain wall is one of the most popular methods of cladding the exterior of a building. In simple terms it consists of a framework in which aluminium, glass, and other surface materials are housed. Although aluminium curtain walls of today appear to present endless variety of design, the majority of these designs can be classified into the following five generally recognized systems:-Check also the following sites for more details and info. Council for aluminium in building,Center for cladding and technology, Facade engineering society. In this system the vertical mullions are usually attached first to the structural frame with anchors followed by the installation of the window sill and head section. Spandrel panels and vision glass are attached within the mullion framework to complete the system. - Difficulties in quality control. - Relies heavily on site workmanship. - Requires different trade men. - Difficult to accommodate building movement. - Difficult to control water drainage to individual floors. - Too many loss parts and components on site. - Poor acoustic and thermal insulation. - Deterioration of expansion and sealant joints. - Units are assembled and glazed under controlled shop conditions. 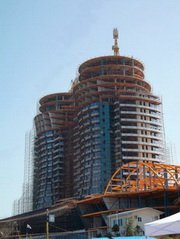 - Full pressure equalization drainage system at each floor. - Shorter construction duration. - Enables other trades to commence work much earlier. As the name implies is a system that attempts to capture the advantages of both the stick and the unit systems. Mullions are installed first, followed by placement of preassembled frame units between them. This system is similar in principle to the unit system, the main difference being that the panels do not consist of vertical and horizontal mullions, but are integral units formed from sheet metal or laminated aluminium honeycomb panels. Unlike other systems, the panel system does not have the rigid discipline of vertical and horizontal grid pattern and can be made to represent a wider range of architectural design flexibility. This system can be thought of as a response of the cladding design to the tube system of lateral bracing, consisting of closely spaced columns and deep spandrels. Advantage is taken of the close spacing of columns by spanning the glazing units directly between the column covers. The system can be engineered to clearly express the structural skeleton and permits wide latitude of aesthetic expression for column and spandrels.